File Types: JPG; File Size: 4.67 MB; DPI: 300 DPI; Dimensions: 5000 x 3450 px. Welcome to the Autumn 2015 collection. This purchase includes ONE High resolution JPEG (300DPI) file. It can be cropped and used as a hero image for your website, a featured image, an ad banner, or be used as a marketing tool to promote your work, photos, titles, or anything else for your business. It is minimalist, feminine, modern and affordable. Thanks to the white space, you can use this same file for different purposes, as long as you change the text. The watermark is also not on the original file. When you purchase an item from White Hart Design Studio you agree to a non-exclusive limited use license that allows for personal or professional use only of the item. You may crop the image and overlay the image with your own text or product images, but you may NOT alter, edit or manipulate the image. Once you have added your product or image to the styled Photograph you (or anyone) may share it on social media for promotional purposes. The original image cannot be shared. White Hart Design Co. remains the sole, exclusive owner and holder of the copyright for the image and you may not sell, lease, loan, transfer, share or give the image to a third-party to use in any way. Thank you! 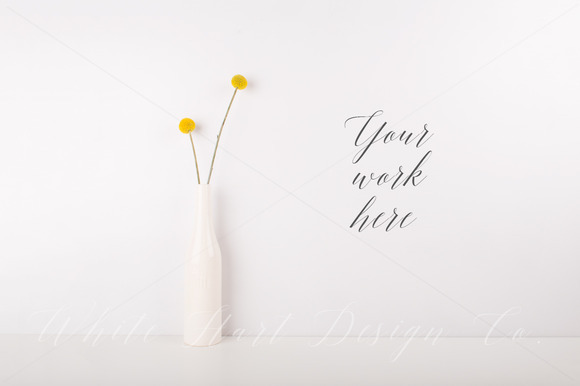 by White Hart Design Co.
Keywords: wallpaper, mock up, 2015 mockup, styled stock photography, wallpaper background, wallpaper mock up, background, showcase, floral, flowers, minimal, wall, art, home decor, styling, rustic, nordic, country, living, simple..
Best ddsign template, vectors, illustrations, video templates from creative professional designers with After Effect, PhotoShop, 3DS Max, Cinema 4D or InDesign. Full details of CreativeMarket Styled stock photography wall 401451 for digital design and education. CreativeMarket Styled stock photography wall 401451 desigen style information or anything related.